Nose: Makes its presence known the moment the cork pops out of the bottle: tar, ink, roast pork (fatty); quite cereally too. After a minute or two the tar recedes and a massive layer of sweet peat descends over the glass. Then brine begins to peep through: the smell of the sea when you’re in it; some graphite too now, and salt crystals. That meaty/porky note never goes away. Yum yum yum! After a while some acidic fruit begins to appear: lemon peel and oil, always with the salt. The peat gets a little barnyardy after a while. It settles down finally with lemon, graphite and sweet peat at the fore. With water the lemon takes over, and it’s more preserved lemon now. The meatiness is still there too–more ham now than roasted pork/bacon. Palate: Massive–I swear I can feel that first swallow burning its way down my gut. Despite the heat it’s still quite expressive: hugely phenolic, with lots of tar and a wave of lemon coming in after an initial sweet introduction; a lot of salt behind the lemon. Not hugely different from the nose. But I think we need to add water. (And when I say “we” I mean “I”, though I’m sure my imaginary friend Fifi agrees. (“Yes, you’d better add water quick!” ed.)) With water it is less salty, the lemon is brighter and a little sweeter, and the smoke is a little drier (more wood smoke now than tar). Finish: In Soviet Russia this whisky finishes you! I mean, the finish goes on for quite some time, mostly with the lemon and the salt and the graphite and the burning peat bog into which some lunatic has tossed a few tyres. 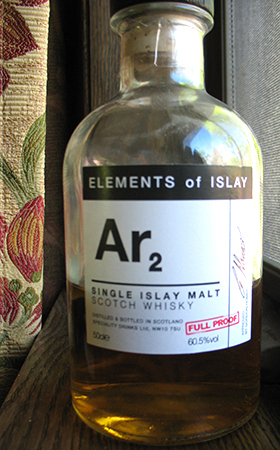 Water emphasizes the lemon and de-emphasizes the salt on the finish too; the peat is still burning but it is sweeter now. Comments: Massively enjoyable. A bruiser at full strength but not unmanageable. Water does make it a little more approachable but I didn’t see much interesting development with water on the nose or palate. Without water this is a 90 point nose but the palate is a bit simple and holds it back. I know this is an Ardbeg but blind I would be just as likely to guess Laphroaig. Now, will we see an Ar3 anytime soon or have Ardbeg closed that door? After all, there’s been a CI5 released in the series, and even Lagavulin is up to Lg3 (how I missed this one, I don’t know). This entry was posted in -Whisky by Rating, 85-89 points, Ardbeg, The Whisky Exchange, Whisky by Bottler. Bookmark the permalink. I am very sad to report that after keeping this bottle alive for almost four years I am finally coming to terms with its impending demise. I am, however, very happy to report that it is still as good as (and almost identical to) the whisky I reviewed above. Yes, it’s a very high strength whisky but sometimes I wonder if we worry too much about the effect of air on bottles that have only been open for a few years.